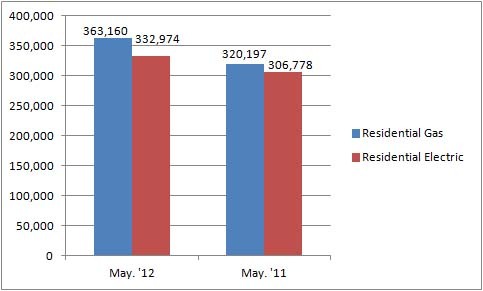 U.S. shipments of residential gas storage water heaters for May 2012 increased 13.4 percent, to 363,160 units, up from 320,197 units shipped in May 2011. Residential electric storage water heater shipments increased 8.5 percent in May 2012, to 332,974 units, up from 306,778 units shipped in May 2011. For the year-to-date, U.S. shipments of residential gas storage water heaters decreased 3.3 percent, to 1,690,674, compared to 1,748,943 units shipped during the same period in 2011. 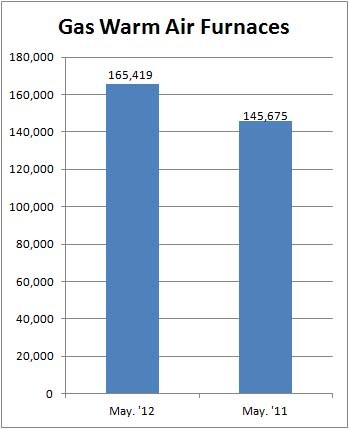 Residential electric storage water heater shipments decreased 0.9 percent year-to-date, to 1,605,559 units, compared to 1,620,072 units shipped during the same period in 2011. Commercial gas storage water heater shipments increased 7.3 percent in May 2012, to 7,019 units, up from 6,540 units shipped in May 2011. 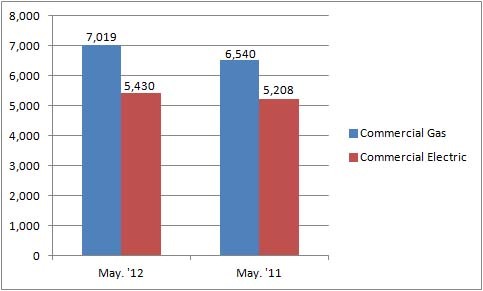 Commercial electric storage water heater shipments increased 4.3 percent in May 2012, to 5,430 units, up from 5,208 units shipped in May 2011. Year-to-date U.S. shipments of commercial gas storage water heaters decreased 7.5 percent, to 33,919 units, compared with 36,656 units shipped during the same period in 2011. Year-to-date commercial electric storage water heater shipments increased 2.8 percent to 26,440 units, up from 25,723 units shipped during the same period in 2011. 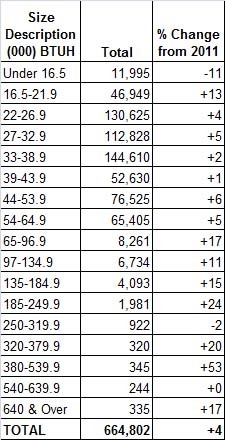 U.S. shipments of gas warm air furnaces for May 2012 increased 13.6 percent, to 165,419 units, up from 145,675 units shipped in May 2011. 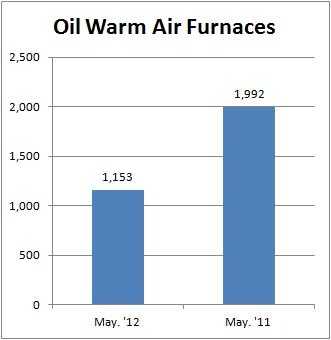 Oil warm air furnace shipments decreased 42.1 percent, to 1,153 units in May 2012, down from 1,992 units shipped in May 2011. Year-to-date U.S. shipments of gas warm air furnaces decreased 5.3 percent, to 742,886 units, compared with 784,361 units shipped during the same period in 2011. Year-to-date U.S. shipments of oil warm air furnaces decreased 35.5 percent to 10,574, compared with 16,398 units shipped during the same period in 2011. U.S. shipments of central air conditioners and air-source heat pumps totaled 664,802 units in May 2012, up 4.4 percent from 636,506 units shipped in May 2011. 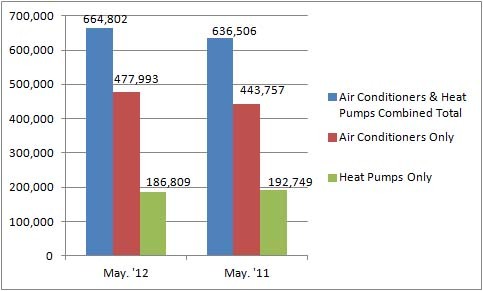 U.S. shipments of air conditioners increased 7.7 percent, to 477,993 units, up from 443,757 units shipped in May 2011. U.S. shipments of air-source heat pumps decreased 3.1 percent, to 186,809 units, down from 192,749 units shipped in May 2011. Year-to-date combined shipments of residential central air conditioners and air-source heat pumps decreased 1.5 percent, to 2,368,679 units, down from 2,403,882 units shipped in May 2011. Year-to-date shipments of central air conditioners increased 2.4 percent, to 1,623,606 units, up from 1,585,585 units shipped during the same period in 2011. The year-to-date total for heat pump shipments decreased 8.9 percent, to 745,073 units, down from 818,297 units shipped during the same period in 2011.